My Mind Wanders...: Say What!!??? 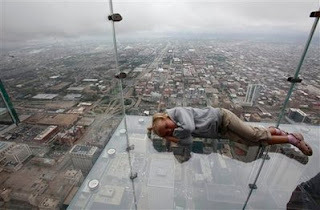 CHICAGO – Visitors to the Sears Tower's new glass balconies all seem to agree: The first step is the hardest. Wow! I didn't know that about the Sears Tower. Long ago, I got sick at the top of the arch in St. Louis. There's a transparent horseshoe-shaped extension over the Grand Canyon. I forget where, exactly. If I were going out on a clear limb, I'd rather it be that one. Oh no, sick at the top of the arch...that stinks!